How much attention was placed on understanding the ins and outs of insurance plans in PT school? The answer, more than likely, is “not enough.” With the ever-changing climate of the health care industry, patients in the clinic often lack a basic understanding of their own health insurance plans. These unknowns must be identified and handled upfront before treatment begins. This is to avoid any misunderstanding that can lead to a patient getting a surprise bill. Confusion over a patient’s out of pocket responsibility can have detrimental effects. More often than not, companies will have a specific department dedicated to ensuring patients understand their financial commitment before they even come in for an initial evaluation. However, many times, patients will accept these terms without truly realizing the cost. In the initial evaluation, the physical therapist is an educator to patients about their conditions, treatment plans, and long term-prevention. Sometimes he or she will also be called on to act as an educator of insurance plans. 1. Deductible - a fixed amount the patient is responsible for paying before the insurance company begins to pay for services. Example: A patient with a $500 deductible will pay the first $500 of medical bills before the insurance plan starts paying. 2. Co-pay - a fixed amount paid on each date of service. However, if a patient has a deductible, the deductible must be met first. Example: A patient with a $10 co-pay will pay $10 on each date of service. 3. Co-insurance – unlike a co-pay, this represents the percentage of cost for which the patient is responsible. Again, this is after any deductible is met. Example: A patient that has a 10% co-insurance would pay $10 on a service that costs $100. 4. Out-of-Pocket Maximum - a fixed amount that is the highest amount a patient can be expected to pay per year. The insurance plan will pay 100% when this is met. 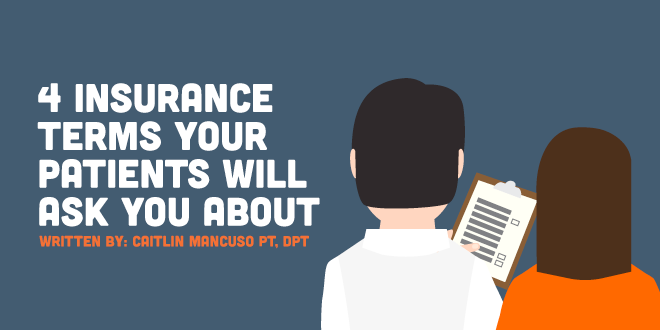 This article is intended to direct your attention to financial understanding, which is a commonly overlooked aspect of patient care. You already performed a thorough evaluation. Your patients trust you and buy in to your physical therapy treatment. They are confident that you can guide them through their established plan of care. Don’t lose them due to unforeseen out of pocket expenses!